Dale Heglund recently joined the UGPTI as program director of the ND Local Technical Assistance Program. In that position he will lead outreach and training programs aimed at state, county and local professionals in the transportation construction industry. 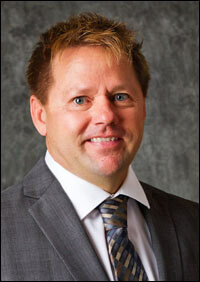 Heglund was the North Dakota sales engineer for Cretex Concrete Products since 2000. Before that, he served for 15 years with the North Dakota Department of Transportation, first as a transportation engineer and then as assistant district Engineer in Dickinson. Heglund also has hands-on experience as an equipment operator with his familyâs construction business in northeastern Minnesota. Heglund earned his B.S. in civil engineering from the University of North Dakota and is also a graduate of the Bismarck-Mandan Chamber of Commerce Leadership Development program. He is a registered North Dakota Professional Engineer and Professional Land Surveyor. He is past president of the North Dakota Society of Professional Engineers and the North Dakota chapter of the American Public Works Association.